Here we go again! The blockchain gates of the next DECENT hackathon have finally been unchained. We welcome all beginners and advanced level coding experts to demonstrate your passion for blockchain and develop real-world dApps. Register now to win the grand prize of 20,000 DCT and the chance to win an exclusive trip to Shanghai, courtesy of our Chinese partner, Wanxiang BlockchainLab. After the tremendous success of our first hackathon in Bratislava, we are excited to announce the next edition of the Blockchain Pioneers Hackathon global series, titled ‘Blockchain4Good: Shaping Smart Sustainable Cities for the Future’. 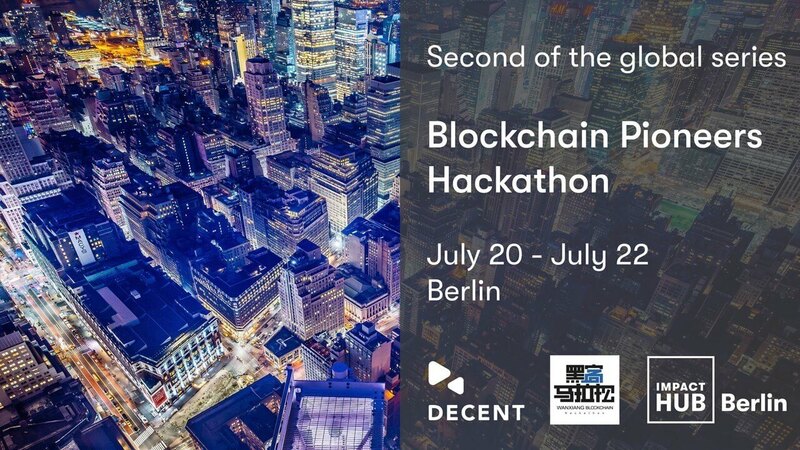 And what better location to start shaping the future, than in the mesmerizing city ofBerlin, Germany, known for its beautiful architecture, history, and as the biggest blockchain hub in the world. This time, we decided to collaborate with Impact Hub, the largest world network focused on building entrepreneurial communities. The hackathon will take place over two days, fromJuly 20 to July 22. During our first hackathon earlier this year, a “fantastic four” of young developers got together and came up with a brilliant blockchain project,Werbifi. Their vision of building a blockchain platform for selling advertisement space on public Wi-Fi landing pages (a.k.a. captive portals) beat out the competition and took home the grand prize. Think you’ve got what it takes to be the next big winner? We are giving out another 20,000 DCT for those who can come up with a project that will knock our socks off! Besides that juicy prize, your winning team will get a chance to collaborate with DECENT and receive exclusive mentoring. Not only that, you will get the chance to compete with the hackathon winners from other cities and prove your ultimate blockchain mastery. The winners will also receive a chance to experience China’s city of Shanghai, with free accommodation, flight tickets, and admission tickets to attend the most iconic annual blockchain gathering in Asia, Shanghai International Blockchain Week. “Future cities need radical ideas, today.” – is the slogan for our next hackathon. This time, the theme will be centered around finding the best decentralized solution that will shape the way smart sustainable cities function. The main areas of focus will beGovernment, Mobility & Logistics, Energy, Finance,andHealth. Using ourDCoreopen-source blockchain platform you and your team will be armed with all the tools you need to build the next blockchain spectacle. You will be forming teams of 2 to 5 people – choosing the size of the crew or its members is entirely up to you. Don’t have a team? Don’t fret, our on-site developers will help you find hacking companions or even a topic that will suit your vision.You can apply HERE. Hurry up, though, registrationends on July 15! Be sure to follow us on social media and join our Telegram to receive more hackathon news! You can also check out our brand new website for the newest DECENT updates. *edit registration date extended to July 15.